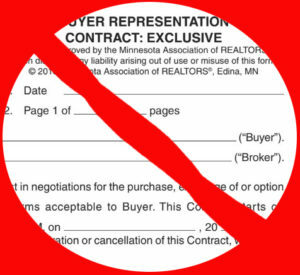 Minnesota Buyer Representation Contracts, Listing Contracts and the Realtor Purchase Agreements are Bad for Consumers. And if you think that the licensing statutes will protect you, think again. Buyer representation contracts make it look like you can negotiate their fee, but the forms make it nearly impossible. They collect whatever the seller is paying and that’s just wrong. It should be the buyer who determines how much their agent get’s paid, not the listing broker. Listing contracts require you to bundle the buyer brokerage fee into the listing commission. It allows the listing broker to decide how much to pay buyer brokers and if they’re going to pay them. You can’t even put a property in the MLS unless you offer compensation to buyer agents. There are ways around this. It is illegal for dual agents to provide you with negotiating advice or advocate on your behalf. If they do, it could cause the entire transaction to be rescinded. Avoid large firms and NEVER agree to dual agency. Buyer representation and listing contracts all entitle the broker to get paid even if the transaction does not close. Really. If your Realtor leaves the brokerage firm, you don’t get to follow him. Your contract is with the broker not the agent and the broker can just assign someone else to you. The forms don’t disclose if referral fees are being paid. Secret referral fees of 25-45% of the commission are paid all the time. This interferes with your ability to negotiate the commission. Buyer representation and listing contracts often have hidden junk fees built into the boilerplate. They can be as high as $500. Buyer representation and listing contracts often try to manipulate you into using their title company. Agents used to help clients shop and compare title firms. The last person you want influencing important title and closing decisions is someone with a huge commission riding on the deal closing. The purchase agreement often is used to force buyers or sellers to pay for home warranties. This product is one of the most complained about products on Angie’s List and are often worthless. However, brokers often make money on them. There’s more. A lot more. Please let me help. ← 13 Reasons to talk to your attorney BEFORE you select a Realtor.